The Digital to Analog Audio converter box takes your coaxial/optical(S/PDIF or Toslink) digital audio source and converts it to standard analog left/right audio, available for connection to an external device such as an amplifier or recording deck via standard RCA-style jacks. You can bridge your legacy sound system with digital sources such as DVD and CD players that don't have RCA-style analog outputs. Simply run a short extension cable from an available digital audio output jack on your digital source device to the same type of digital input on the Converter. Select which kind of digital signal (coaxial or optical) is being input with the selector switch on the converter, then hook up your analog RCA-style left and right cables to the Converter's analog RCA jack outputs and power up all equipment. 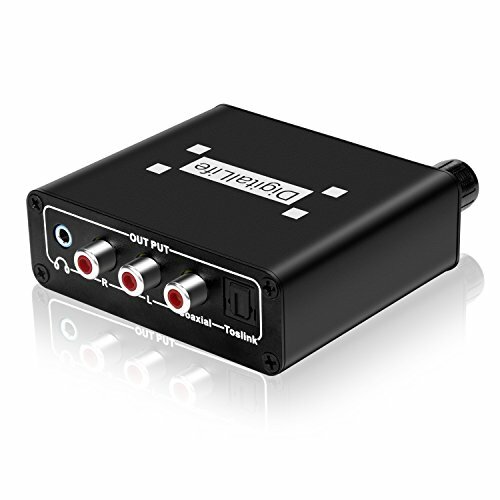 Converts Coaxial or Toslink (SPDIF, Optical) Digital Audio Signals to Analog L/R Audio or 3.5mm Audio Output. Supports 2-channel LPCM (Linear Pulse Code Modulation) and 24-bit S/PDIF incoming bitstream on left and right channels. DAC Interfaces - Input Audio Connector: 1xToslink (SPDIF, Optical), 1 x Coaxial | - Output Audio Connector: 2 x RCA(R/L), 1 x 3.5mm Jack. Supports 32 kHz to 96 kHz sample frequency range.